1950s style dresses emphasized a fragile, somewhat bubbly femininity. Bare shoulders, bare legs, and big busts were all seen as attractive. Bright printed fabrics were all the rage, especially in America. Despite the emphasis on the hourglass figure, few 1950s dresses show cleavage, opting instead for a simple scoop-neck or high collar. The emphasis on the bust generally came from undergarments like the corselette, or the "cone" bra, which made the bust look like two torpedoes. Full skirts drew attention to the legs and hips. 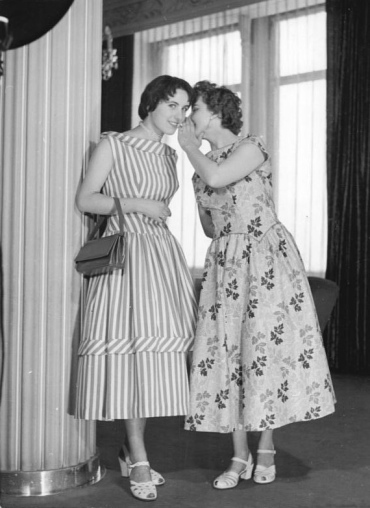 Many 1950s style dresses were also worn with belts, which further accentuated the low waist-to-hip ratio; the hourglass silhouette was constantly emphasized, in print and on celluloid. Christian Dior's "New Look" influenced fashions throughout the decade, while his S-, H- and A-Line cuts influenced the cut of women's suits, separates and leisure wear. Almost all 1950s style dresses bear some Dior influence, if not in pattern and construction, at least in sihouette. Balenciaga created alternative, compelling dress silhouettes during the 1950s, including the high-waisted babydoll dress, the tunic dress, and the sack dress, a seemingly shapeless garment that was nonetheless flattering, if only because it left something to the imagination. Women often dressed up for day-to-day life, whether they were meeting friends or going to work. Part of this dress-up involved such accessories as stockings, small gloves, hats and scarves, which would contrast the main pattern of the dress and draw attention to the hands, the face, the hair, and so on. In the above photo, the woman on the left is wearing a light-colored dress suit with a patterned beret and matching scarf. 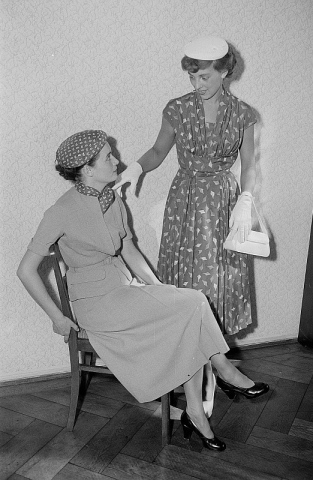 The woman on the right contrasts the dark, mid-size pattern of her dress with a white hat, purse and pair of gloves. Her outfit draws attention to both her body and her face; the other woman is simply washed out by her light outfit, while the smallness of the beret/scarf pattern distracts from her face. However, these details, and the way they're worn (note the scarf tied at the side of the neck) are emblematic of 1950s style. 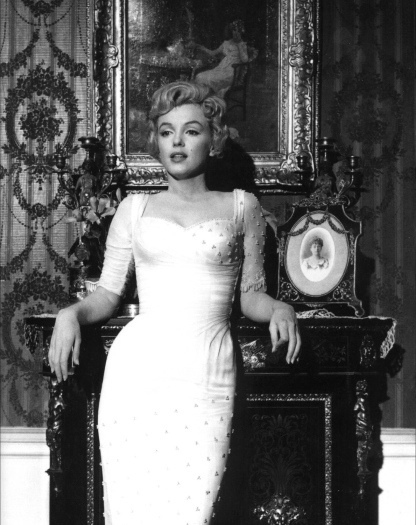 Dresses were often paired with high heels, which were worn low (by today's standards) but with a stiletto heel. These heels were almost always darker than the rest of the outfit, or, if the outfit was brightly colored, they were in an eye-catching color like candy-apple red. This brought attention to the shape of the foot, as well as the paleness of the woman's skin. 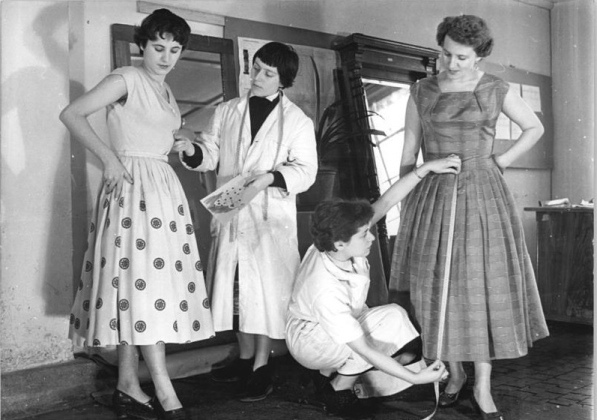 Young girls, even teenage girls, often wore dresses with an empire waist, short sleeves, and a peter pan collar, along with buttons going up the front. Balenciaga updated this look for women with the high-waisted "babydoll" dress. This look remained popular for years afterwards, popping up in the most unlikely places. 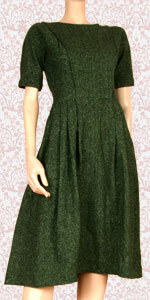 Our article on 1950s style dresses is part of our Vintage section.